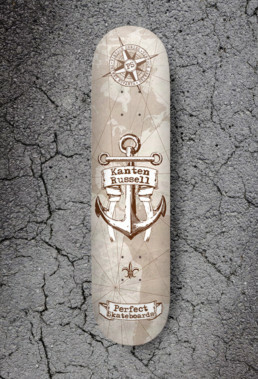 I have been given the opportunity to design a few pro model decks over the years. Whenever possible, I try and get some input from the skater. Kanten was super easy to work with brought a couple of ideas to the table. He wanted either a microphone or an anchor. I knew just where to go with the anchor, and created a map and compass to go with it for effect. We made a couple of minor adjustments, and added a Fleur de Lis between the truck holes, and it was board everyone was happy with.